Nephrite has caught Sailor Venus and the Imperium Silver Crystal! Despite getting there too late, Sailor Mars tries to save Sailor Venus with a powerful Akuryou Taisan which knocks Nephrite off of her. Nephrite moves to run away as he has the crystal he came for. Sailor Venus mockingly tells him to stop, strikes a pose and causes the crystal to explode. Nephrite yells at her for destroying the crystal but Venus simply holds up an orange case and opens it. Out of it pours several crystal tiara copies. The crystal she had was a fake! Nephrite teleports away. Sailor Mars asks Sailor Venus what's going on. Sailor Venus that when she awakens as a true Sailor Soldier, everything will become clear. As soon as Minako leaves the building, her vision begins to blur and she leans against a wall. Artemis asks her if she's okay. In the Dark Kingdom, Nephrite appologises to Beryl for having lost the crystal. Kunzite says that perhaps Sailor Venus doesn't have the real Imperium Silver Crystal at all. He then tells them that he has a rather interesting plan of his own. At Crown Karaoke, Ami is alone with Luna, knitting mittens for the girls. Makoto enters (after walking past a very grateful Motoki who loves his new scarf). She doesn't stay long though as she's become torn over having not told Usagi that Hina is not just Mamoru's girlfriend, but also his fiance. Makoto quickly leaves to find Usagi and tell her the truth. As she leaves, Rei enters and sits down next to Ami. She tells her and Luna that she's decided to become a more powerful individual and will be fighting less as a group because the Princess is also fighting alone. She then decides to leave and track the enemy. Luna comments that everyone seems to be going their separate ways lately. Ami agrees but says that she's sure everyone will be back together soon. At Usagi's house, Hikari has dropped by again and invites Usagi to come along with her "boyfriend" and Mamoru as a kind of double date. She agrees and the four go to a wonderful Japanese dirt park (who needs grass in this day and age?). Makoto sees Usagi with Mamoru and decides to follow them, intent on telling her about Mamoru's situation as soon as she can. Elsewhere in Tokyo, numerous Youma illusions have started flashing up all over the place and scaring people. Rei sense this activity and runs to one of many locations. In the park, Usagi is horrified to see that Hina has arrived to join them. Hikari then drops the bombshell that Hina is engaged to Mamoru. Suddenly Usagi sees Youma appearing in the park and excuses herself to track them down. She follows them into a forest and transforms into Sailor Moon but can't get a lock on the Youmas. Ami, meanwhile is walking home alone after waiting for everyone to return to Crown and is confronted by Kunzite! She quickly transforms into Sailor Mercury and then attacks him with Shine Aqua Illusion and Aqua Mist but both attacks are easily deflected. Kunzite then withdraws his sword and swings it at Sailor Mercury, consuming her in purple dark energy. Mercury struggles but eventually succumbs to the energy and passes out. 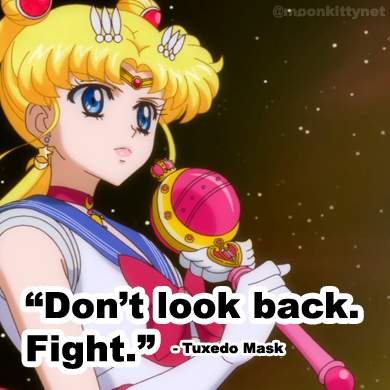 Back in the park, Makoto has come across Tuxedo Mask running to help Sailor Moon and comes to the conclusion that he is Mamoru. She confronts him and tells him she knows who he is. 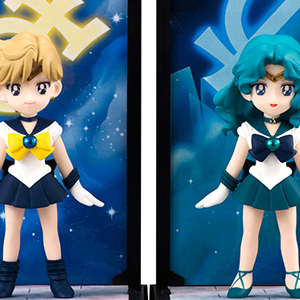 Sailor Mercury, meanwhile has completely disapeared with Kunzite. Sailor Venus showed an unusual ability to destroy her fake crystal tiara by simply pointing her fingers at it. For more info on this move, click here. Unlike Western countries, most parks in Japan have compressed dirt instead of grass to cover the ground. Several reasons have been given for this such as the Japanese belief of controlling nature and it being easier to maintain however recent studies have shown that parks like this are contributing to the rising city temperature throughout the year and massive efforts are now under way to green these parks.